Welcome to Budleigh Fish Café (previously the Premier Café), serving traditional fish & chips - and much more - to take away or to eat in our licensed restaurant, in the picturesque seaside town of Budleigh Salterton, East Devon. All our food is freshly cooked, to order. This means that you may wait a little longer than at other establishments where food is cooked in advance and kept warm until it is needed. We passionately believe that this means our food is fresher and tastier. During busy times - such as school holidays - we advise that you book a table if you wish to eat in our restaurant, to avoid disappointment. Please ring us on 01395 442962 to book. We are unable to take table bookings via email or social media - because we're busy preparing and serving delicious food. If something doesn't quite meet your expectations during your visit, please tell us at the time so we have the opportunity to rectify any issue. Want to come and join our busy team? We're looking for a restaurant/takeaway person. Come and work at a small, friendly but busy family-owned café with a reputation for good food. We have both a 32-seater restaurant and a thriving take-away. We are looking for an enthusiastic person who is prepared to be trained and willing to work in the different areas of the business as required and who can demonstrate excellent customer service skills. ​Please e-mail your CV to info@budleighfishandchips.co.uk. Last orders in the restaurant are taken 30 minutes before closing. Booking is strongly advised, please ring 01395 442962. Mr Fish says "take a look at our children's menu for the little ones in your life!" On Tuesdays and Thursdays we are able to provide totally gluten-free fish and chips, suitable for coeliac sufferers. At other times this will depend on the availability of a dedicated gluten-free cooking area. If you require gluten-free food, please ring us to check in advance. Gluten-free batter is always available, but may be cooked alongside non-gluten-free batter. 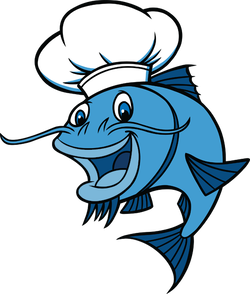 Additionally we have non-battered fish and other gluten-free options (burger, risotto etc) on request. ​Please feel free to ring and check - 01395 442962.